Experience the rhythmic drums of Tahiti and the blowing of conch shells to announce the beginning of your luau. Chief Tama and the Drums of the Pacific Revue will take you on an enchanting and unforgettable journey through the Islands of Polynesia. Hang loose, take your shoes off and get comfortable as lovely female hula dancers of Polynesia tell romantic stories with their hands and their hips. In addition, our warrior men will entertain you with their charm and amaze you with the climatic fire knife performance. Houston why just have any ole ordinary party when you can have “The Complete Hawaiian Experience” on location! Drums of the Pacific is Houston’s ultimate one stop luau production company. “Ono” is the Hawaiian word for DELICIOUS, and this is the best way to describe this luau feast! Enjoy authentic Hawaiian food catered especially for your festive journey through paradise. 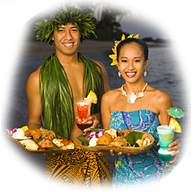 Your guests will savor the flavors of Hawaii with Kalua Pork, Teriyaki Chicken, Fresh Garden Island Salad, Pineapple Nut Cake and the rest of our famous luau menu. We’ll enhance your guests dining experience with carefully placed floral decor of freshly picked orchids and plumeria flowers. a single choice of Coconut Lychee Cake, Pineapple Macadamia Nut Cake or Pineapple Fruit Tree Medley. Pineapple Fruit Drinks and Premium Bottled Water. Chief Tama and his cast of talented performers will take your party to the exotic South Pacific. Our high energy show will surely make your next function a true success. We have lots of fun with your guests and encourage audience participation to break the ice and turn the heat up. 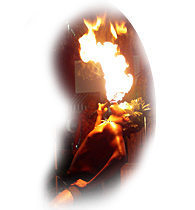 Experience lovely hula dancers, spectacular fire knife dancers, tropical sets and vibrant music. Sound system and lighting included.